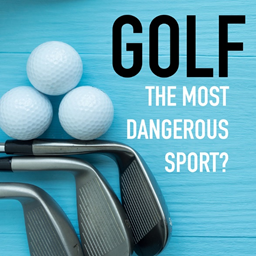 Golf: Is it the Most Dangerous Sport? The PGA may not look like it has much in common with professional rugby - but you may be surprised to learn that golfers are actually injured more often than rugby players. In fact, 62% of amateurs and 85% of professionals will sustain a significant injury associated with playing golf. And with a staggering 60 million golfers worldwide - that’s a whole lot of people getting injured. The problem is, and professional golfers often overuse their muscles with frequent play and amateur golfers are usually out of shape or have poor swing mechanics,. Trauma to the lower back accounts for one third of all injuries and can happen to anyone regardless of age or ability. There are a two logical reasons for this. Firstly, compared to other sports, golf puts a lot of pressure on your spine. Consider the average golf swing produces a compression load on your back equal to 8 times your body weight, whereas a sport like running produces a compression load just 3 times your body weight. With the average recovery time lasting 2-4 weeks, addressing the main causes of injury is well worth the effort. So, the question is - How can you enjoy the wonderful game of golf while reducing your risk of injury? The simple answer is through targeted and routine conditioning. Golf requires strength, endurance, flexibility and explosive power in order to play the game well - and not hurt yourself in the process. Physical conditioning routines designed specifically for golfers can help you stay on the green and out of pain. And as a bonus, conditioning your body to avoid injury while playing golf also helps you improve your game. Whether you’re a casual golfer or serious about your game we can help you avoid injury and improve your skills. That’s why we’d like to share with you our free informational fact sheets on Golf Injury Prevention. And be sure to check out our Facebook page https://www.facebook.com/EnergizeSportsMassageWirral/ where we’re posting fun, informative tips and tricks to help you stay injury-free - whatever you’re doing.